To investigate the safety and efficacy of a Polyzene-F nanocoat on new low-profile self-expandable nitinol stents in minipig renal arteries. Ten bare nitinol stents (BNS) and 10 stents coated with a 50 nm-thin Polyzene-F coating were randomly implanted into renal arteries of 10 minipigs (4- and 12-week follow-up, 5 animals/group). 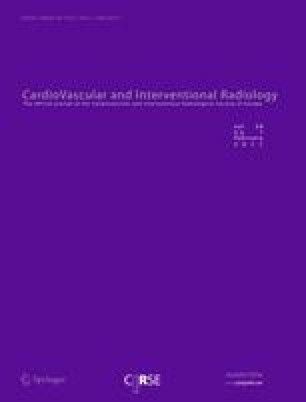 Thrombogenicity, on-stent surface endothelialization, vessel wall injury, late in-stent stenosis, and peristrut vessel wall inflammation were determined by quantitative angiography and postmortem histomorphometry. In 6 of 10 BNS, >50% stenosis was found, but no stenosis was found in stents with a nanothin Polyzene-F coating. Histomorphometry showed a statistically significant (p < 0.05) different average maximum luminal loss of 55.16% ± 8.43% at 12 weeks in BNS versus 39.77% ± 7.41% in stents with a nanothin Polyzene-F coating. Stents with a nanothin Polyzene-F coating had a significantly (p < 0.05) lower inflammation score after 12 weeks, 1.31 ± 1.17 versus 2.17 ± 0.85 in BNS. The results for vessel wall injury (0.6 ± 0.58 for Polyzene-F-coated stents; 0.72 ± 0.98 for BNS) and re-endothelialization, (1.16 ± 0.43 and 1.23 ± 0.54, respectively) were not statistically significant at 12-week follow-up. No thrombus deposition was observed on the stents at either follow-up time point. Nitinol stents with a nanothin Polyzene-F coating successfully decreased in-stent stenosis and vessel wall inflammation compared with BNS. Endothelialization and vessel wall injury were found to be equal. These studies warrant long-term pig studies (≥120 days) because 12 weeks may not be sufficient time for complete healing; thereafter, human studies may be warranted. Authors U. S. and G. M. R received a research grant from CeloNova Biosciences, Newnan, GA, and G. M. R. has served as a consultant to CeloNova Biosciences, Newnan, GA.